This guy? This guy from Bring It On: In It To Win It, is part Filipino?!? Are you kidding me? Maybe not but when I saw him on Bring It On: In It to Win It, I thought he was Hispanic or something like that – but, yeah, he looks a bit Filipino. ‘Cause you know, it’s a Bring It On movie – Universal Studios and all that fancy schmancy. And, I heard he’s gonna do the sequel for The Rock’s movie, Scorpion King. I mean, cool. 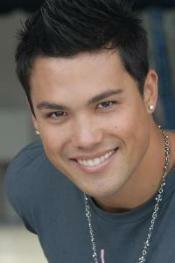 I dont care if he is part filipino or not he is still HOT! !